One Yard Wonders has proven a challenging sew along. Not that the book isn’t chalked full of great ideas, but that it seems our loyal readers and joiners from the previous sew alongs haven’t been as inspired. 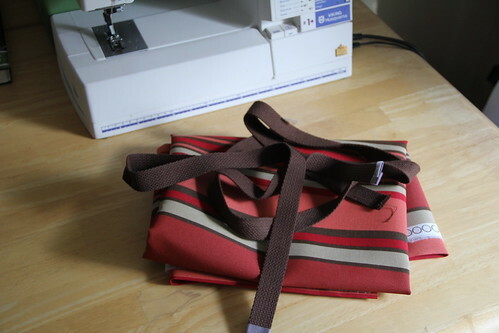 And to be honest, with the craziness that has been my 2010 — I simply haven’t been sewing as much. That said, my fine friend, you are the WINNER WINNER CHICKEN DINNER. Because, alas, you were the only entry in the September/October sew along. But never fear, you did make yourself a sweet little hipster bag. So it wasn’t all for nothing, right? That said, Fin — we have to spice things up pronto. Crafters unite! 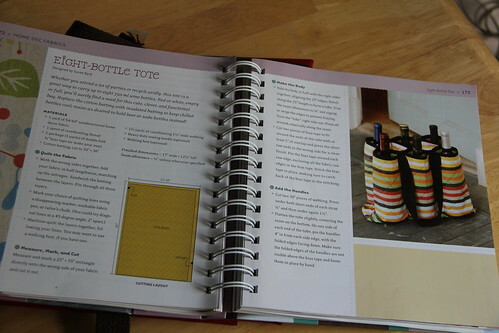 For the November/December Fin + Donk OYW sew along, the project is: ANY PROJECT IN THE BOOK. That’s right. 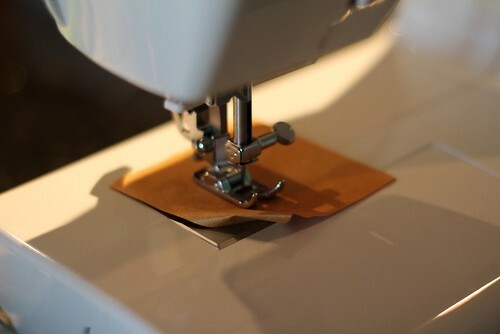 We are taking off the parameters, asking you to pick a project at will, and get to sewing. Show us what you are making, explain why you are making it and throw that photo into the craft pool. Fire up those Singers, ladies. It’s time to get to business. First, may I just wish you a belated birthday? How was it? I hope your package of birthday goodies from Arizona have arrived and that you were spoiled rotten with gin + tonics, fancy yarn, new gardening tools, running gear, time with your Bubba and time in nature. Plus pie. Perhaps rhubarb. I hope it was truly lovely. This time of year always makes me think of you — the years we worked together in college — and how the beginning of a new Fall semester meant a great birthday party for Finny. It seems only right we honor you by sewing up the Not-Ugly-Trash-Bag for this double-month’s sew-along. I love this project. In fact, [SPOILER!] chances are if I typically sew you a Christmas present, this is exactly what you’ll be receiving. They are practical, keep things clean, are easy to sew and they have the Finny stamp of approval. Check, check, checkity check. Thank you for participating ladies. So, Finny — what are our next sewing assignments from One Yard Wonders? Directions Preheat oven to 350 degrees F (175 degrees C). Grease loaf pans. Combine sugar, oil and eggs; beat until smooth. Add water, pumpkin, carrots and spices. In medium bowl, combine flour, soda, salt, and baking powder. Add dry ingredients to pumpkin mixture and blend just until all ingredients are mixed. Bake in preheated oven until toothpick comes out clean, about 1 hour. Can’t wait to hear what we are sewing up Finny! A Pinch of Creative Spirit, Shall We? I opened my mailbox Saturday to a giant box from Colleen. She saved the original cutout she created of the cover, signed and framed it with gorgeous fabric and sent it my way as a congratulatory gift. There weren’t enough Kleenex in the house. I thought about editing out the toaster, but this is life. My home isn’t a gallery, but the kitchen just got a lot more aesthetic thanks to Colleen’s incredible generosity. In other crafty news, for those participating in this month’s One Yard Wonder sew-along and want some guidance on sewing the Elodie Elephant, Sue found a great set of tutorials on Youtube. Brava! And on a final note, holy Mary Moses! On toast! How adorable are these baby dolls Shanna has created for the Brazilian Babies project?! I have such amazing artists in my life. I’ve got a super cute fabric, plenty of bias tape and I’m ready to roll. I just haven’t gotten there quite yet. Thankfully, others did. You picked a great winner for this double month’s projects. It’s about time we made YOUR pattern for the Not Ugly Car Trash Bag. I might be a little proud. (Kinda like BP might be in a little trouble. Aretha may need to loose a little weight. Oprah may have a little money.) How cute is that Airedale in the photo? Answer: not as cute as Miss Lola, who I doggy-sat this weekend. 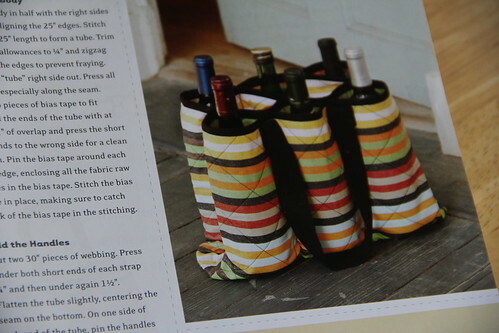 As the One Yard Wonder sew-along goes, Finny and I post a sewing project from the book, along with a great recipe to try. This month’s recipe is Fin’s fabulous summer strawberry salad.Yum. I love salad. I love fruit. I love them combined. Good work Fin! As a participant in the monthly challenge (bi-monthly in the lazy summer months), you pick a sewing project or two, and/or the recipe and share them on your blog and post photos to the photo pool. We randomly pick one rocking winner a month to reward to crafty goods. Craft on, my friends. Craft on. Friends, my life is so scattered at the moment, I feel like a sandcastle that’s just been hit by an ice cold wave. Then again — it is self-imposed chaos after three back-to-back trips and a new job. And so, I ask that you hang in there with me while I get reorganized. 1. My recipe for this month’s OYW project? 1/2 cup of peanut butter. NOT 1 1/2 cups. Jeez. So — 1/2 a cup of PB. Cute clothes. Two months to complete. Cook. Sew. Go! 1. The Help. 4 out of 5 bananas. I really enjoyed this read and it left me with a newfound hunger for southern American writers. I actually bought Faulkner after reading this. It is a beautiful story of race, women, motherhood, and the South in the 1960s. This was an anti-vampire book club selection and I was very pleased. Read this book. 2. Little Bee. 3 out of 5 bananas. I also enjoyed this, mainly because it discusses both refugees and Africa. I thought the story was interesting and the characters were good. I simply wanted more. The main character in particular — Little Bee — was fascinating and I felt like we only got a glimpse at who she really was. Plus the ending left me wondering if it was written for a sequel. Nonetheless, any book that discusses these heavy topics is a winner with me. I appreciate the author’s attempt to teach the masses about those often overlooked in society. 3. The Blood of Flowers. 3 out of 5 bananas. An interesting story about Persian women and carpet making centuries ago. I am currently reading, The Elegance of the Hedgehog for book club. It is translated from French and you can tell, which drives me a little batty. But the story is so far keeping my attention. I am debating several options for my selection for book club next month, including Brady Udall’s newest book, The Lonely Polygamist. Udall is the author of one of my favorite books of all time, The Miracle Life of Edgar Mint. Others under consideration include: People of the Book and Half the Sky. Also? I currently have about 10,000 tomatoes, thanks to those 23 plants I planted back in January. I am going to can tomatoes this weekend, like some sort of homesteader. And do laundry. And by groceries. Because, by golly, I will catch up, put away the suitcase. I will. I will. I will! I’ve been on the road for the last few days and am behind, behind, delightfully behind. A couple pre-new-job-trips have me happily distracted. However, in trying to keep up with the new gig and the suitcase that hasn’t been put away for several weeks, I’ve been delayed in posting the new OYW projects! Did you pick a winner? Is it my turn to pick a winner from the dog collar project gone awry? 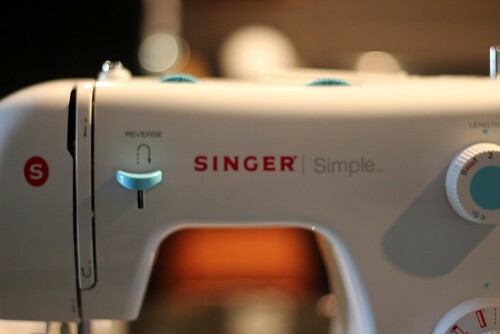 What do you suggest for the May sewing project? For the May cooking project, how about what I made last night. This goes with our theme of being both seasonal and cleaning up what you have in the pantry. Because let’s be honest — who doesn’t have 5-14 different boxes of pasta in their pantry that have 1 serving left? This recipe calls for angel hair, but I guarantee is delicious with whatever you’ve got. Including a handful of peppers from the farmer’s market. .5 cups of peanut butter (or almond paste, if you’d prefer) — updated! Boil water for pasta. Cook for 6-8 minutes — al dente. In a wok or other large pan, brown onion and garlic with olive oil. Add diced veggies — minus the scallions. Add dash of vinegar and teriyaki. Drain pasta, saving 1/2 cup of cooking water. In the pan you cooked the pasta, add 1/2 cup of cooking water, 2 cups of warm water with chicken bouillon cube, peanut butter, another dash of teriyaki and a dash of cayenne. Mix until it comes to a simmer. Return pasta to this sauce and mix. Plate with cooked summer veggies on top, with a handful of peanuts and scallions. This is excellent with grilled asparagus on the side and a nice red wine. Or two. Don’t judge. Did you see how many veggies were included in this recipe? A few more grapes won’t hurt. Safe to say, I’m not having much sewing luck these days. While your pattern in One Yard Wonders is adorable and I can’t wait to make it, I’ve had nothing but trouble from the others we’ve so far selected for our monthly sew-along. This month’s Pampered Pooch project was no better. Dharma, the family pooch, is always next to my mom. In this case, by the sewing table. I read the pattern for the dog collar with two dogs in mind: Sydney — the super guest, and a new puppy friend — The Snows of Mount Kilimanjaro (Kili). I read the pattern. And then I read it again. And then one more time. Not only was I going to have to guess the length of their necks but I also had no luck finding an O ring at my sewing shops in town. So I did what any logical seamstress would do. I took the project to Texas and asked my sewing mama for help. Now, I’m going to add the following details as background information — not simple bragging. My mother has won international sewing prizes for her quilts. She’s got more ribbons pinned to sewing projects than you can imagine. Some of these quilts have taken years (like her Dear Jane.) So a simple dog collar shouldn’t be Everest, or in this case — Kilimanjaro. Alas, even she threw in the towel after two hours of trying to make the instructions work. As you noted, this collar is a Martingale style. Most vets, pet salons, dog parks, etc., require quick release collars. So the shopping for supplies, the gorgeous orange Mozambican capulana I cut up for the fabric and the time trying to decode the pattern were a complete waste. I see you had problems too. I also see you are far more motivated than I am and you turned these lemons into lemonade. (My mom and instead made margaritas.) I’ll have to give your pattern a whirl! Next month? I’m going to let you happily pick the sewing project. And I promise to do it and be happy about it. May I suggest the laptop sleeve? That looks simple enough. Or better yet — how about your trash bag?